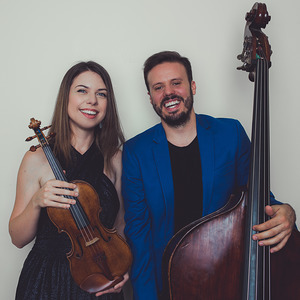 The violin-bass duo Tessa Lark & Michael Thurber brings a genre-bending blend of bluegrass, jazz, classical, and original works to life in high-energy performances built on audience interaction and a fun, welcoming stage presence. Lark and Thurber met as alumni of NPR’s From the Top and have grown their duo collaboration out of the unique musical variety show series Thurber Theater, which Michael regularly hosts at beloved New York City nightclub Joe’s Pub. They now offer their signature sound and charisma to venues across North America. The duo’s debut album Invention, due out in 2019, comprises music of J.S. Bach along with non-classical original compositions. Michael enjoys a reputation as one of the most versatile young musical talents currently active in New York City. Whether he’s playing bass on The Late Show with Stephen Colbert, composing music for the Royal Shakespeare Company, co-founding the smash YouTube channel CDZA, or hosting Thurber Theater, his musical voice defies genre and category. Tessa, both a classical virtuoso and an expert fiddler in the tradition of her native Kentucky, is consistently praised for her astounding range of sounds, technical agility, captivating interpretations, and multi-genre programming and performance. In the classical realm she has earned many of the top awards available to young artists including a 2018 Borletti-Buitoni Trust Fellowship and a 2016 Avery Fisher Career Grant, the Silver Medal in the 2014 International Violin Competition of Indianapolis, and first prize in the 2012 Naumburg International Violin Competition. Lark and Thurber both began their musical training at midwestern institutions, with Michael attending Interlochen Arts Academy and Tessa participating in the Starling Preparatory String Project at the University of Cincinnati College-Conservatory of Music. Tessa went on to study with Miriam Fried at New England Conservatory and earn her Artist Diploma from The Juilliard School, while Michael also studied at Juilliard.